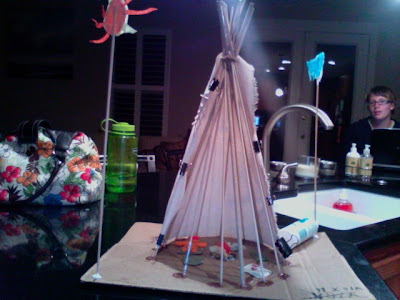 Last night we were trying putting the finishing touches on Super Son's Native American Indian project before it was due at school this morning. I was ready to jump up and down with frustration. I apparently, even with my sewing skills, do not possess the ability to fabricate a tipi cover from canvas. This should be a pretty basic cone shape, right? I resorted to a pattern.